You can admire a beautiful view across Perugia from the rooftop terrace at Hotel Fortuna. 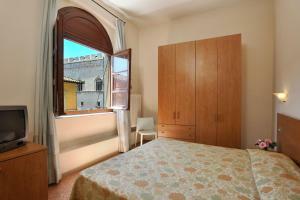 This charming property dates back to 1300 and is very close to Corso Vannucci. Start your day at the Fortuna Hotel with a rich continental breakfast in the medieval breakfast room, which boasts 16th-century frescoes. The hotel also features a cosy reading room, a free internet point, and a roof garden where you can watch the sunset over Perugia and the valley. 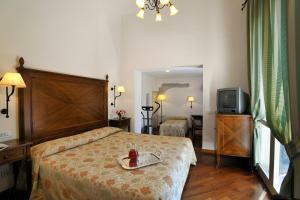 Each guest room comes with satellite TV and air conditioning. Some feature a hydromassage shower. 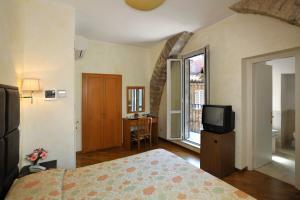 Choose an executive room and in addition you will find original frescoes, plus a terrace and/or living area. Making your reservation is easy and safe. Select a room. Then press the book now button. Subsequently the reservation form appears and you have to confirm your booking. We will then send you an instant confirmation message by email. Cancellation and prepayment policies vary by room type. Please check the room conditions when selecting your room above. Your reservation is absolutely secure. All personal data is encrypted and will be processed in a secure way. We take the privacy of your personal data very serious. Your personal information will only be used to process your booking. We will not charge you any reservation fees for making this booking, nor charge your credit card. You will simply pay for your stay at the hotel. Cancellation is free of charge; provided you adhere to the notification period stated in the hotel cancellation policy. All rooms are elegantly equipped with private bathroom, shower , telephone, mini-bar, hairdryer, safe, satellite TV and air conditioning. Some rooms feature a shower-sauna and jacuzzi. The Hotel also has executive rooms, particularly impressive with frescoes from 1700 and/or with terrace and private living-rooms. A breakfast buffet is available in the hotel and is served in a medieval breakfast room. Breakfast features cheeses, cereals, fruit juices, eggs and other typical continental breakfast produce. 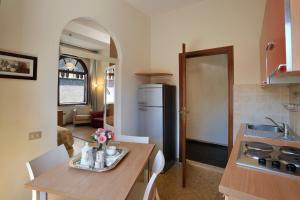 We also have agreements with nearby restaurants, offering reduced rates. Perugia was one of a dozen major cities in the mysterious Etruscan galaxy. In Perugia we can peel away the epochs: one of the town gates is called the Arch of Augustus. The loggia spanning the arch dates from the Renaissance, but the central part is Roman. Builders from both periods used the reliable Etruscan foundation, which was the work of architects who laid stones to last. Today the city is the uncrowned capital of Umbria; it has retained much of its Gothic and Renaissance charm, although it has been plagued with wars and swept up in disastrous events. The city today is centre of one of the most important universities and art academies, attracting a young, vibrant crowd, some of whom can be seen in one of the many local bars and cafes enjoying the famous chocolate “baci” (kisses). To capture the essence of the Umbrian city, you must head to Piazza IV Novembre in the heart of Perugia, where you’ll find the Fontana Maggiore, built some time in the late 1270s by a local architect, a monk named Bevignate. The fountain’s artistic triumph stems from the sculptural work by Niccolò Pisano and his son Giovanni. After viewing the marvels of the fountain, you’ll find the other major attractions such as: Cathedral of San Lorenzo, built in the Gothic style on the 14th and 15th centuries. Inside, you’ll find the Deposition of Federico Barocchi. In the museum, Luca Signorelli’s Virgin Enthroned with saints is displayed. Palazzo dei Priori, one of the finest secular buildings in Italy, dates from the 13th century and shelters the “Galleria Nazionale dell’Umbria”. Its façade is characterized by a striking row of mullioned windows. Over the main door are a Guelph lion and a griffin of Perugia, which hold chains once looted from a defeated Siena. An escalator has been installed to take people from the older part of Perugia at the top of the hill and from the upper slopes to the lower city. During the construction of the escalator, the old fortress Rocca Paolina was discovered, along with buried streets. The old streets and street names have been cleaned up, and the area is well-lit, with an old wall exposed and modern sculpture added. Umbrian events include: Umbria Chocolate, Chamber Music Festival of the Nations, Rockin Umbria, Brogue Traces in Foligno and Umbria Jazz, the most important jazz event in Europe. Moreover near Perugia you’ll find the most important tourist places such as Assisi, Gubbio, Orvieto, Spoleto, Todi, Spello and Foligno. - Exit the A1 at Val di Chiana. - Enter the sliproad Perugia-Bettolle and exit at Perugia S.Faustino. - Go towards the centre ('centro'). - At the roundabout in Piazza Garibaldi, take Viale Indipendenza on the right of Hotel Sangallo. - Turn left in Via Bonazzi. - Exit the motorway at Orte and take the E45 towards Perugia. Exit Perugia S.Faustino and follow as above. From the railway station Fontiveggie (Perugia Centrale), take bus number 9, 11 or 7 to Piazza Italia. Once there take the stairway on the bank's side (Banca d'Italia) and reach Via Bonazzi. From Sant' Egidio airport you can go by taxi or rent a car. Go towards the clearway and then towards Perugia, then follow the instructions above. For those of you arriving by car, the hotel is in a restricted traffic area but hotel guests have permission to enter. The easiest thing to do is park at Piazza Partigiani and take the escalator straight up to the hotel. Via Bonazzi is blocked by an illuminated barrier. Simply press the bell in the wall on your right to deactivate it.